Such are the traits that set great teachers apart. Such are the words mentioned, again and again, in letters recommending Rebecca George, instructional assistant professor of mathematics, as one of the 2016 recipients of the John C. Butler Excellence in Teaching Award. This award, which was established in memory of former College of Natural Sciences and Mathematics Dean John Butler, recognizes faculty members who challenge, engage and inspire their students. W. Anthony Frankino, associate professor of biology and biochemistry, is the other Butler Award recipient. Every year, the Butler Award is given to one instructional faculty member and one tenured/tenure-track faculty member, and is accompanied by a plaque and a $5,000 prize. Award recipients are also recognized at the NSM Convocation in May. Nominations may be made by NSM departments, student organizations, faculty and students. George received letters of nomination and support from faculty, current students and former students. George leading a Calculus study session. (Photo credit, Chris Watts, NSM)George, who joined the Department of Mathematics in 2007, teaches a wide range of courses, including Calculus I, II and III, Introductory Statistics and Statistics. Her reputation for being an effective and dedicated teacher means that her sections fill up quickly, often within a day or two, and that her students consistently score the highest on department-wide exams. 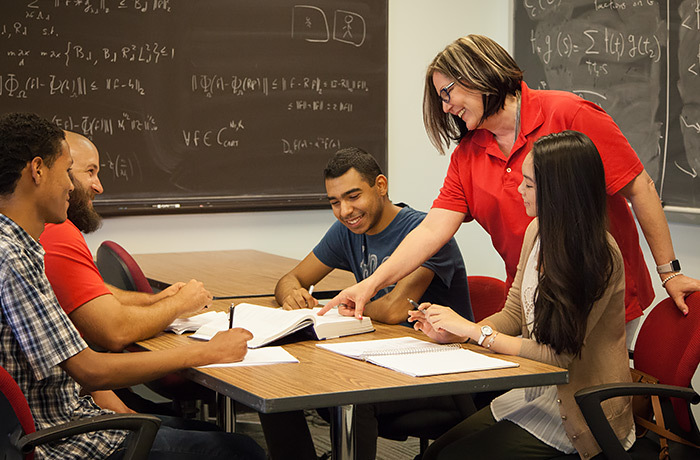 In addition to her teaching responsibilities, George has created a lasting impact on the quality of instruction offered at UH by instituting massive changes to the instructional material used for Engineering Mathematics, Calculus I, II, and III, as well as Introductory Statistics and Statistics. In addition to her impact at UH, George also created educational material that is helping students the world over. She created two Massive Online Open Courses on Coursera to prepare students for the AP Calculus and Statistics exam. Meanwhile, George’s creation of a database of electronic problem sets is being used by hundreds of high school AP Calculus teachers, and thousands of their students, in order to prepare for the AP Calculus exams.